I’ve looked up many cousins in the Ellis Island immigrant database. I’ve viewed many ship manifests. Every now and then I see something I’ve never seen before. Such was the case with the ship manifest for the Carreiro family. Luiz Carreiro, his wife Francisca Julia da Conceicao Pacheco (aka Remigio Pacheco), their five children Maria, Jose, Manoel, Luiz, and Jacintho, and Luiz’s mother, Maria do Espirito Santo Carreiro, were on the ship the Reginia d’Italia which arrived at Ellis Island on 2 May 1910. Their final destination was Fall River, Massachusetts. The ship manifest held a plethora of information including who they were going to meet in Fall River, MA, as well as information on Luiz’s brother and Maria’s son living in Maia, Ribeira Grande on Sao Miguel Island in the Azores chain. What I didn’t expect to see was a word that was stamped by all their names on the ship manifest: DEPORTED. I have never seen this before on a ship manifest. I guess the family was refused at Ellis Island and set back to the Azores. But why? I decided to check to see if the family showed up in census records in the US. The ship arrived after the 1910 census, so that wouldn’t be any help. 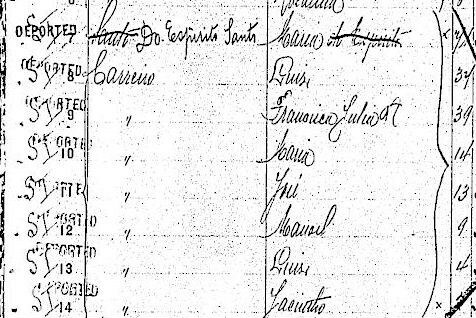 Searching for Luis Carreiro by exact name and Soundex turned up nothing in the 1920 census. Same with the 1930 census. I had information on his daughter, Maria. She married someone named Andre Serpa. I do not know if they came to the US. Searches in the 1920 and 1930 census pulled up nothing. It appears that my relatives were part of few who were turned away at America’s shores. I wonder what happened when theywere designated for deportation? Would any type of paperwork exist explaining why they were sent back to the Azores? This is a whole new research area for me. I’m not sure if this is worth pursuing, but I’m curious about it all the same. If anyone knows how deportations were dealt with, I’d sure like to hear about it. If nothing more than to understand what the experience may have been like for this family.